A lumbar discectomy is a surgery to remove part of a spinal disc in the low back that is herniated or ruptured. The discs of your spine separate your vertebra. When a disc is damaged, it can place pressure on your spinal nerves. WHAT PARTS OF THE SPINE ARE TREATED WITH A LUMBAR DISCECTOMY? A lumbar discectomy surgery is performed through an incision in the lower back, which is commonly referred to as the posterior region. Your spinal discs are comprised of two main parts, including the annulus fibrosis and the nucleus. The annulus fibrosis is the tough exterior around your spinal disc that securely connects the vertebrae above and below. The lamina bone is the protective covering that forms a roof-like structure over the back of the spinal cord. During lumbar discectomy, the lamina bone is carefully removed from the damaged disc. What can lumbar discectomy help achieve? 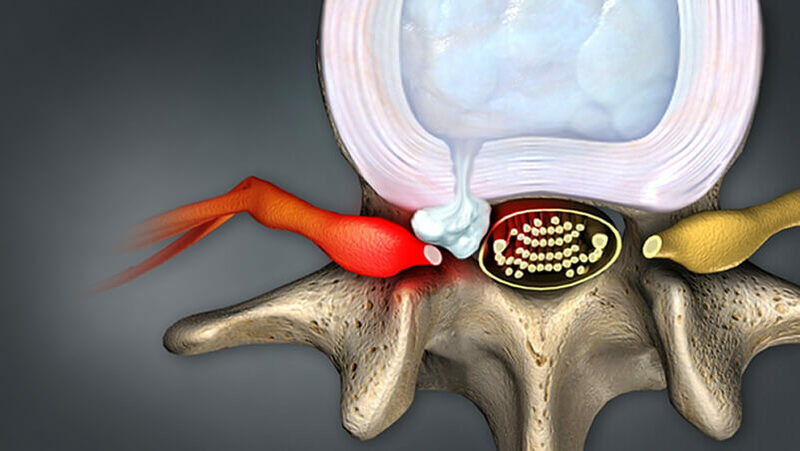 Helping to alleviate symptoms from a herniated or damaged disc in the low back, a lumbar discectomy is designed to remove the part of a disc that is putting pressure on a nearby nerve. By removing the damaged areas of a lumbar disc, Dr. Rozbruch can help reduce the possibility of this disc becoming injured or damaged again. There are 2 popular lumbar discectomy surgeries, including traditional discectomy and microdiscectomy, which will be explained later. How can I prepare for lumbar discectomy surgery? General anesthesia is often used during a lumbar discectomy. In some cases, Dr. Rozbruch may monitor and assist your breathing during lumbar surgery with a ventilator to ensure proper airflow. Some lumbar discectomies may be performed under a specialized spinal anesthesia, which is injected into the lower back and helps to numb the lower limbs and spine. During a lumbar discectomy with spinal anesthesia, a specific medicine will be administered to keep you properly sedated. A special frame is often used during lumbar discectomy surgery, allowing you to rest while kneeling face down. This position provides adequate support to the abdomen so that the stomach is relaxed and free of pressure. This kneeling position can also help reduce blood loss during a lumbar discectomy and provide Dr. Rozbruch with a higher degree of mobility. What can I expect from lumbar discectomy surgery? Orthopedic surgeon Dr. Rozbruch can help you decide if a traditional lumbar discectomy or microdiscectomy is right for you. A discectomy and laminotomy is the traditional surgery to move the spinal disc. During a spinal discectomy, the lamina bone will be removed from the disc or discs that are damaged. Removing the lamina bone provides Dr. Rozbruch with additional room and mobility during discectomy surgery. An incision will be made in the middle of the lower back. The tissues above the herniated or damaged disc will gently be separated. An X-ray scan may be taken at this point of the discectomy surgery to ensure that the correct disc is being removed. Once the portion of lamina bone is removed, Dr. Rozbruch will place a small incision along the ligament between the lamina bone and spinal cord. The symptomatic nerve is placed to the side in order for the damaged disc to be carefully examined. An incision will then be placed on the outside of the disc. Within this incision, forceps will gently be placed so that the disc material may be properly flushed out. Dr. Rozbruch will then examine the disc to ensure that all disc fragments have been successfully removed. The next step during a laminotomy is to observe the nerve root and examine it for any tension or pressure. If the nerve does not have a proper range of motion, Dr. Rozbruch may place an incision in the nerve passage that is between the vertebrae to grant proper mobility. In some lumbar discectomies, a specialized pad may be placed over the nerve root to reduce the possibility of scar tissue forming on the nerve. Additionally, Dr. Rozbruch may place a drain tube within the incision if he feels it may promote healing. A microdiscectomy is a type of discectomy that is performed through a small surgical microscope. To begin a microdiscectomy, a small incision will be placed in the lower spine above the damaged disc. Similar to a laminotomy, the tissues are gently separated to uncover the lamina bone and spinal discs. An X-ray is often taken at this step of a microdiscectomy to ensure that the correct spinal disc will be operated on. A surgical retractor is then used to move apart the lamina bone above and below the damaged disc. A small incision will be placed in the spinal ligament to uncover the spinal nerves. Dr. Rozbruch will then place a specialized hook under the root of the nerve. This hook can help raise the nerve root to help Dr. Rozbruch better view the damaged spinal disc. Dr. Rozbruch will then place an incision along the outer ring of the damaged disc. Disc material will be removed through this incision, which reduces the possibility of the spinal disc herniating or becoming damaged again. Only the damaged portion of the spinal disc is removed during microdiscectomy surgery, which leaves the spinal disc more intact. Any loose fragments of the spinal disc will then be removed from the surrounding areas. One of the final steps of a microdiscectomy is to ensure that the nerve has adequate mobility. Dr. Rozbruch may clean out the nerve passage in the middle of the vertebrae to provide the nerve with a higher range of motion. The muscles and tissues of the lower back will be gently placed back, and sutures will be applied to the external incision. Many orthopedic surgeons recommend a microdiscectomy surgery as a herniated disc treatment because it is performed using a small surgical microscope. By using a surgical microscope, the external incision on the lower back does not have to be as large as it is during a traditional discectomy. Microdiscectomy is a minimally invasive spinal surgery with a shorter recovery time than traditional discectomy. Some orthopedic surgeons also believe a microdiscectomy may be simpler to perform, while also reducing nerve and joint scarring. This can promote a quicker, healthier lumbar surgery recovery. What can I expect after lumbar discectomy surgery? Following a lumbar discectomy surgery, most patients are able to get out of bed a few hours after their surgery. It is important to note that you should only move your back cautiously and stop a motion if it causes discomfort. If a tube was placed within your incision to drain the surgical site, it is commonly removed the day following your lumbar surgery. Dr. Rozbruch will determine when you may return home after a lumbar discectomy based on your rate of healing, level of pain, and other post-operative measurements. In most cases, a patient should be able to return home the day following a lumbar discectomy. Patients recovering from lumbar surgery should not drive for at least 1-2 weeks following surgery. Lifting objects and bending should be avoided completely for the first 4-6 weeks of your recuperation. Light activity can usually be resumed 2-4 weeks; while heavier activity can be resumed within 2-3 months. Outpatient physical therapy should begin 2-3 weeks after your lumbar discectomy. How long does it take to recover from lumbar discectomy surgery? Physical therapy is commonly prescribed for patients recovering from a lumbar discectomy. Physical therapy usually lasts between 4-6 weeks following a discectomy. While physical therapy can be discontinued at this point, full recovery from lumbar spinal surgery may take up to 4 months. Physical therapy can help reduce pain and inflammation. For additional relief, ice may be applied to help reduce discomfort. For muscular spasms or discomfort, a gentle massage around the surgical area may help alleviate these symptoms. As you heal from lumbar discectomy surgery, light exercises will slowly be added into your physical therapy regimen. These exercises may help to improve the function of your lungs and heart. Following a discectomy, exercises such as swimming and walking are often prescribed. Your physical therapist may prescribe certain exercises that can strengthen the muscles of the lower back. Your physical therapist will help you create a proactive treatment regimen to help you develop new movement habits. This exercise regimen can help to keep your back in safer positions to avoid pain or discomfort. To begin adopting these new movement habits, your physical therapist may explain simple tasks such as getting dressed or out of bed. These movements will then progress to learning how to safely lift or carry objects while protecting your lower back. At the end of your physical therapy sessions, your physical therapist will begin to customize your sessions to help you prepare to go back to work. Your therapist may instruct you on different ways to complete a task while protecting your back from injury or damage. How can I learn more about lumbar discectomy? To learn more about lumbar discectomy, please request an appointment online or call Dr. Rozbruch’s orthopedic office in NYC at 212-744-9857. Prior to an office visit, please fill out Dr. Rozbruch’s patient forms to expedite your first visit.